Theatergoers in Chicago have a new way to enter the musical HAMILTON's popular lottery with the release of an innovative HAMILTON app. Beginning August 27, patrons can enter the lottery through HAMILTON's newly-minted app (www.HamiltonBroadway.com/app) or via the long-standing method, online at www.HamiltonBroadway.com/Lottery). The #Ham4Ham lottery allows fans to enter to win two tickets to HAMILTON for only $10 each. This is now made even easier to enter with the addition of the HAMILTON app. 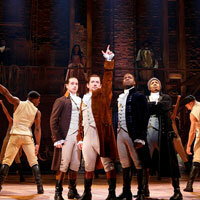 To download the HAMILTON app, visit www.HamiltonBroadway.com/app. The new Chicago Lottery system opens at 11:00 a.m. CT 2 days prior to the performance and closes at 9:00 a.m. CT the day prior to the performance for that lottery. The first new lottery registration begins online or through the new HAMILTON App on Sunday, August 27 at 6 p.m. CT for the August 29 performance. Notifications will be sent at approximately 11 a.m. CT the day prior to the performance, and the purchase window for Lottery Tickets will be from 11:01 - 4:00 p.m. CT on the day prior to the performance. The HAMILTON app went live to the public on August 11 and, to date, has over one-half million users. In addition to the lottery, the official HAMILTON app provides access to stickers, camera filters, a merchandise store, music, news and exclusive content with Lin-Manuel Miranda and the various HAMILTON companies around the country. Future features on the app will include exclusive ticket access, augmented reality, an enhanced #EduHam experience, and interactive karaoke tracks.